Please let this be true. Now we can taste the forbidden meat AND make our breath minty fresh. I'm generally a fan of doing good things for the environment and the world - especially if I can make a snarky comment about it. When I stumbled upon this site, it was just a head scratcher. Apparently Green is now Kosher. So buying a low emission vehicle is Kosher. Well, taking steps to make the world a little better - sure, call it a mitzvah, but Kosher designation? Get me a rabbi, so we can both make fun of this. But it gets better. KosherCar.com is plugging low emission cars - fine - good for them. But they go one step further, and give the reasons why. And I'll take the liberty of cutting and pasting from their site. Here are 8 reasons why Jews (and like-minded people) should step-up to a special responsibility to reduce oil dependence by only driving kosher cars. Because oil dependence and climate change are serious problems, these 8 reasons are deliberately facetious -- yet have some serious undertones. 8) It's what Moses (and Jesus) would do. 7) It will enable you to forgive yourself for all those years you drove gas-guzzling, earth-polluting cars. 6) Mentches drive kosher cars. 5) You'll be a car maven and role-model in your community -- your Jewish mother will kveln and your friends will admire you. 4) Hummers and gas-guzzling SUVs are gehshtorbin. 3) You won't feel guilty for driving treyf in traffic. 2) Driving a kosher car is a mitsve. Because it's just too funny. And they guy who produced the video is kinda-sorta related to me. Can you eat me now? So, now we can finally order takeout on Shabbos. 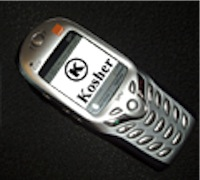 Introducing the KOSHER PHONE! Apparently it is a telephone which can be used on the day of rest. And seriously, even if I had a phone I was allowed to use on Shabbos - everyone I know is praying - so what's the point? And the question of the hour - how does it taste?